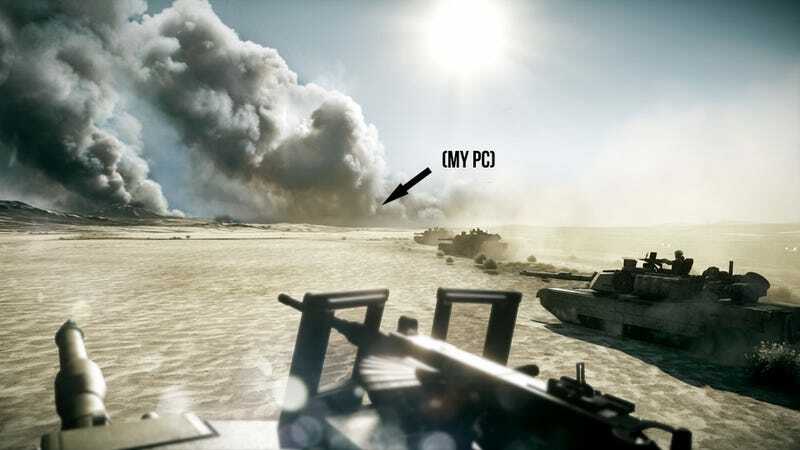 The latest casualty of the EA/Origin-Steam war is Battlefield 3, a title of no small consequence to the PC gaming community. Electronic Arts has confirmed the heavily anticipated combat shooter will not be sold through PC gaming's dominant digital distribution service, apparently for the same reasons that have seen other top EA PC titles removed from its catalog. "Battlefield 3 will not be available on Steam as the service restricts our ability to directly support players," an EA spokesperson told Kotaku. "The service limits our ability to deliver patches and downloadable content directly to players. No other download service has adopted these practices. At EA, supporting our players is a top priority, and we are happy to partner with any download service that does not restrict our ability to connect directly with our own consumers." This is the same line EA deployed when PC heavyweight Crysis 2 disappeared from Steam, coincidentally about a month after the launch of Origin, the EA digital distribution platform. This had serious ramifications when it involved Crysis 2, a game that showed its muscle best on the PC, and Dragon Age II, a genre with a heavy PC constituency. Military shooters, however, are something else. They have an enormous, and an enormously vocal, constituency on the PC. Battlefield 3, then, is fighting a two front war. One against Call of Duty, and the other, on Origin's behalf, against Steam. Its absence from Steam shows which fight matters more to EA. It'll be interesting to see how this plays out, given that PC gamers profess to despise Origin almost as much as they claim to loathe Activision and Call of Duty.